1) 360 VR Experience is not suitable for those who are pregnant, have high blood pressure, acrophobia, suffer from motion sickness, inner ear infections or claustrophobia, had any form of recent surgery, pre-existing binocular vision abnormalities, heart conditions, epileptic symptoms or wear an implanted medical device such as a pacemaker. 2) 360 VR Experience is not suitable for children under 6 years old. 3) Children under age 11 years old must be accompanied by an adult. 4) If you feel dizzy or not comfortable during the 360 VR Experience, please inform our staff to stop the ride immediately. Collection Information Present your iVenture Card on arrival. Requires an admission ticket for sky100 Hong Kong Observation Deck for entry into 100F as well as a ticket to enjoy VR experience. You can use your iVenture Card to obtain both of these. Closed Days If there is any whole deck or north deck private event, 360 VR Experience will be closed. Please check the latest opening hours before the visit. Developed by Sun Hung Kai Properties, sky100 Hong Kong Observation Deck is located on the 100th floor of International Commerce Centre, the tallest building in Hong Kong. At 393 metres above sea level, it is the only indoor observation deck in Hong Kong offering 360-degree views of the territory and its famous Victoria Harbour. This world-class attraction is complemented by a well-connected transportation network and prestigious shopping mall. It also features Hong Kong’s fastest double-deck high-speed elevators, which reach the 100th floor in just 60 seconds. You can now experience flying up high to 393 metres above sea level with the cutting edge VR technology. After putting on the VR headset and sitting in the specially designed VR Chair, you will embark on a 2-minute 360-degree VR Experience where you will find yourself suspended in the air, overlooking the beautiful day and night scenery exclusively at sky100! You will be shown the spectacular view of flying at 393m above sea level and feel the difference in changing weather conditions like tropical cyclone, get through the ocean of clouds and changes of sunset according to seasons.Check out the world renowned skyline from a brand new perspective outside the window, be amazed by the moon over the harbour, huge fireworks and light show right in front of you! sky100 Hong Kong Observation Deck introduces the features of Hong Kong’s culture and its unique story via fascinating multimedia exhibits and regular festive campaigns. 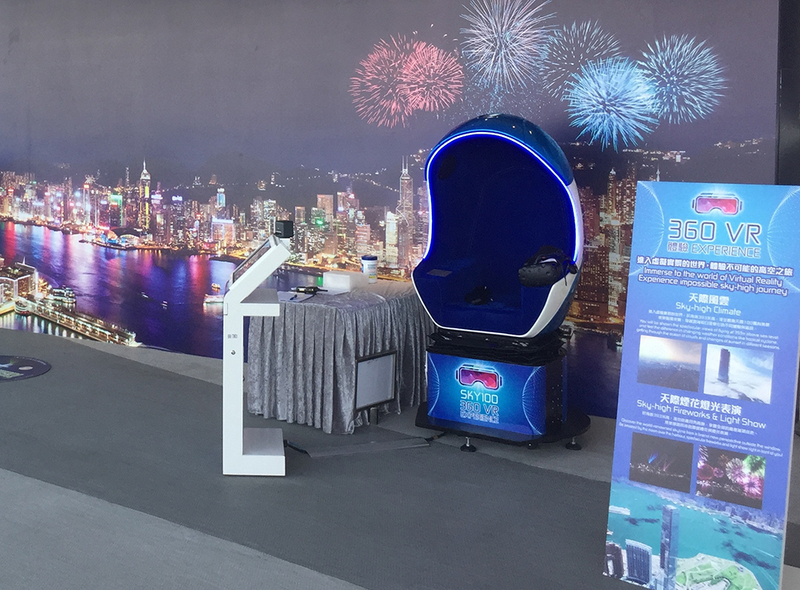 The interactive sky100 mobile app and the newly introduced “Sky-High Tech Zone” create a virtual dynamic world which allows guests to discover the beauty of Hong Kong in a brand new perspective through Augmented Reality (AR) and Virtual Reality (VR) technology. Guests can savour a range of delectable treats and enjoy boundless seaviews at Café 100 by The Ritz-Carlton, Hong Kong on the west side of the deck, a truly double delight of taste and visual pleasure. sky100 proudly offers visitors and their loved ones Hong Kong’s most memorable sky-high experience in every season and at all times of day. sky100 Hong Kong Observation Deck is easily access through a number of public transportation options. Atop of Kowloon Station which is easily connected by MTR ( underground ) within the city, Airport Express Train in just 20 mins to / from HK International Airport, Cross Border Bus to / from Shenzhen or the neighboring cities in Guangdong provinces. sky100 Hong Kong Observation Deck is offering full 360° stunning views of the city and its famous Victoria Harbour. With Café 100 by The Ritz-Carlton, Hong Kong and various interactive installations, sky100 provides visitors unforgettable sky-high experiences.